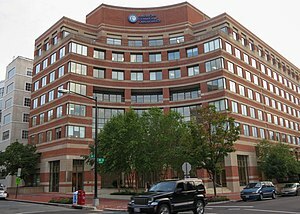 The American College of Cardiology (ACC), based in Washington, D.C., is a nonprofit medical association established in 1949. The ACC bestows credentials upon cardiovascular specialists who meet its qualifications. Education is a core component of the College, which is also active in the formulation of health policy and the support of cardiovascular research. The American College of Cardiology was chartered and incorporated as a teaching institution in 1949, and established its headquarters, called Heart House, in Bethesda, Maryland, in 1977. In 2006, the College relocated to Washington, D.C.'s West End neighborhood. Past papers for the institution are held at the National Library of Medicine in Bethesda, Maryland. The ACC is governed by its officers, including the President, President-Elect, Vice President, Secretary, Treasurer, Chief Executive Officer and Board of Trustees. Members of the Board of Governors serve as grassroots liaisons between the local chapters and the College’s national headquarters. The President serves a one-year term. The ACC has approximately 50,000 members, including physicians, registered nurses, clinical nurse specialists, nurse practitioners, physician assistants, doctors of pharmacology and practice administrators, specializing in cardiovascular care. Becoming a Fellow of the American College of Cardiology (FACC), Associate Fellow (AACC) or Affiliate member is based on training, specialty board certification, scientific and professional accomplishments and duration of active participation in a cardiovascular related field. At least 75 percent of professional activities must be devoted to the field of cardiovascular disease. Those achieving highest distinction in the field are awarded the title Master of the American College of Cardiology (MACC), a title bestowed upon a maximum of three practicing cardiologists each year. The ACC maintains 48 chapters in the U.S. and Puerto Rico. Chapters are legally distinct entities from national ACC and do not share budgets or staffing. However, as of 2008, national members automatically become members of a local chapter. As early as the 1980s, the ACC partnered with the American Heart Association (AHA) to develop the first clinical practice guidelines for cardiovascular practice. In the 1990s, the ACC used the guidelines to lay the groundwork for studies documenting discrepancies best and actual cardiovascular practices. The ACC works with national organizations such as the National Heart, Lung and Blood Institute (NHLBI) to continually develop and update these guidelines. In 2000, the ACC partnered with the AHA to begin development and publication of national performance measurement standards and data standards for both inpatient and outpatient care based on the guidelines. Measurement sets developed by ACC/AHA include: coronary artery disease, hypertension, heart failure, atrial fibrillation, cardiac rehabilitation, STEMI/NSTEMI, primary prevention and peripheral arterial disease. In addition, the ACC has submitted its measures to the National Quality Forum (NQF), with the majority of its measures receiving endorsement as national standards. The College has also collaborated with specialty societies to undertake the task of developing and publishing clinical data standards. Clinical data standards developed include those for acute coronary syndrome, atrial fibrillation, heart failure and electrophysiology. The ACC has published criteria for Single-Photon Emission Computed Tomography Myocardial Perfusion Imaging (SPECT MPI), Cardiac Computed Tomography (CCT) and Cardiac Magnetic Resonance Imaging (CMR) Imaging, resting transthoracic and transesophageal echocardiography (TTE/TEE) and echocardiography. Appropriate use criteria on coronary revascularization have also been developed. The ACC’s National Cardiovascular Data Registry (NCDR®) is a recognized source for measuring and quantifying outcomes and identifying gaps in the delivery of quality care. Data from NCDR is used in select pay-for-reporting and/or performance programs to demonstrate the benefits and challenges of such incentive programs. To date, the ACC has developed five hospital-based cardiovascular registries. In addition, the PINNACLE Registry™ is the nation’s first and largest practice-based cardiovascular registry. In 2011, the ACC and The Society of Thoracic Surgeons (STS) launched the STS/ACC TVT Registry™, which tracks transcatheter valve therapy (TVT) procedures. Currently several key quality initiatives are underway to help translate science into practice and improve outcomes for cardiovascular patients. These projects include the Door to Balloon (D2B) Alliance, Hospital to Home (H2H) and Imaging in FOCUS. Launched in November 2006, the D2B allicance is focused on helping hospital not only reduce, but successfully sustain door-to-balloon (D2B) times to meet the guideline-recommended time of 90 minutes or less. The D2B Alliance provides hospitals with the evidence-based strategies and resources to focus on process improvement, interdisciplinary cooperation and coordination to substantially impact their door-to-balloon times, and thus, dramatically improve patient outcomes. The H2H initiative, led by the ACC and the Institute for Healthcare Improvement (IHI), is a national quality improvement campaign to reduce cardiovascular-related hospital readmissions and improve the transition from inpatient to outpatient status for individuals hospitalized with cardiovascular disease. Launched in 2009, H2H seeks to examine and address readmission problems. Imaging in FOCUS is a community designed to guide implementation of appropriate use criteria and ensure patients are receiving the right care at the right time; the initiative has produced innovations such as pocket cards and mobile applications; access to an online community; and access to webinars, educational programs and performance improvement tools. The ACC Foundation (ACCF) offers a variety of educational programs and products tailored to the needs of clinicians in a variety of specialty areas at all stages of their careers. ACC also advocates for health policies that allow cardiovascular professionals to provide quality, appropriate and cost-effective care on such issues as Medicare physician payment, medical imaging, health care reform implementation, medical liability reform and funding for prevention and research. Globally, the ACC is active on policies that address non-communicable diseases. ^ "American College of Cardiology archives 1929-2008". National Library of Medicine.